Welcome to today's Cutting Corners tutorial for Riley Blake Designs! Let's explore some ways to make gorgeous gathers! We'll test some samples, learn some tips for success, and answers to ruffly questions you never knew you had! Always pretty, ruffles look terrific whether gathered into a seam such as a skirt or apron; sleeves, pockets, bags, etc., or applied as ruffled embellishments at necklines, across a pillow, quilt, bag, shirt - here, there and everywhere! and four or five 4-1/2" x 3" rectangles. Here's how I learned to gather: The "Two-Strand" technique. Used in garments mostly - with seam allowance no smaller than 5/8". Set stitch length to the longest possible on your machine (mine is a 5). Leave a long tail at the beginning and ending of your thread, at least 4", then stitch a line 1/4" from the edge of the fabric; Do NOT backstitch. Stitch another line of basting at about 1/2", careful not to cross lines. Separate the top threads from the bobbin threads, and pull together, sliding fabric toward the center of the piece, bunching the fabric together as you go. Repeat from the other end, again working toward the middle so you don't snap threads or pull the threads loose and have to start again. Continue sliding the fabric along the threads until you reach the desired width. **TIP: Once the piece is gathered to the correct width, give a little tug on the bobbin threads to lock the ends so the gathers don't slide out. Distribute the gathers evenly, then pin well and stitch to a base fabric. I usually divide my base piece and my ruffle piece into quarters or eighths and either clip or pin or mark in some way, then match up the marks and pin together. That way I know that there is equal distance between the pins to distribute the gathers more evenly. Then I pin as much as possible to get those gathers to lie flat without folding sideways or bunching up in weird spaces. I usually flatten and re-distribute the ruffles between each pin as I stitch. Stitch using a 5/8" seam allowance, keeping edges as even as possible. ?? What about gathering extra long widths, say the circumference of a skirt? Mark or pin at equal divisions on the base piece and on the longer piece, then pin together at those corresponding marks before pulling up the threads to gather. Sometimes, I'll start a gather in each section, which helps to ensure that threads don't snap somewhere in the middle of a long stretch of fabric. I use a pin to bring up the threads. ?? My thread always breaks! If a thread does break while gathering, just smooth out the piece and re-baste that section, overlapping stitching lines adjacent to the beginning and ending stitches where the thread broke, careful not to stitch over any existing stitches. Or try using a heavy thread in the bobbin, and pull the bobbin threads to gather. If it works for 4-H kids at sewing camp, it should work for anyone! ?? How do you calculate how much fabric to gather? A good rule of thumb is 2-1/2 times the desired finished width. That produces a lovely, full gather, easily distributed and easy to manage. A slight gather or ease uses 1-1/2 times the desired width, and super-stiff ruffles can use up to 6 times the width (think Tutus). Today's samples are about 2 : 1. ?? What about other options? Is there anything easier? So glad you asked! Try this one - The Zig-Zag technique! Use a zig-zag stitch over Dental Floss or heavier thread. Stitch length: average to long. Stitch width: 4.0 or wide enough to clear the dental floss. then pull the other end of the floss to gather. Distribute gathers evenly; stitch into 5/8" seamline. Result: A bit more boxy than the 2-strand, but saves time/thread/frustration. Back: one bobbin thread - should be easy to gather, right? Front: Uhhh, NO. I tried it so you wouldn't have to. You're welcome! Now, here's something terrific to try: Fuse 'N' Gather. One of Nancy Zieman's newest products from Clover TM, packaged in 6 or 15 yards - enough to gather a 3-tiered skirt or even a bed skirt. I picked up a package at Fabric Fest, and thought I would test it here. with blue stitches facing up. Separate threads at ends for gathering. then repeat from the other side to ensure stitches are not pulled out completely. Tie a knot or anchor threads at both ends to secure. Stitch into a 5/8" seamline if applied at the edge for gathering. Result: Quickly done, produces large, loose gathers/pleats. And finally, what about this technique? Three-Strand gathers. This is what they're teaching the kids these days in tailoring classes. then stitch one row below the seamline at about 3/4". Remove the lower basting line once it is stitched into a seam. Result: A more refined, neat, beautiful gather. Might just be worth the extra effort! Another option: There are specialty presser feet made strictly for gathering/pleating. I've even used a ruffler on a serger. 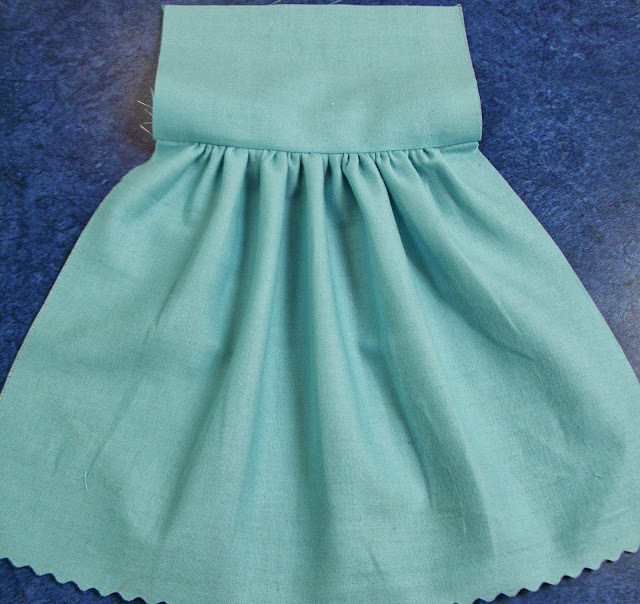 These gather at a certain ratio with a lot of little tiny pleats, but could work well in a lot of cases. That's it for today - Thanks for joining me for this tutorial! 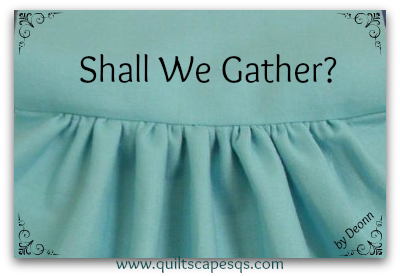 We'll have more ruffly-gathery techniques to explore soon, including shirring - pleats - rouching - using elastic to gather - and we'll see if we can revive that old art of smocking in a new way! Can't wait to try the floss and zigzag! October 08th, 2013 at 9:10 a.m.
October 09th, 2013 at 5:39 a.m.
October 09th, 2013 at 12:53 p.m.
Usually my preferred method is zigzag with crochet thread, but I'm going to try the 2 gathered rows with 3rd row stitching beneath the actual stitching row. Looks like it keeps the gathers flatter & more evenly spaced while stitching. Thanks for sharing! October 26th, 2013 at 8:07 p.m.
July 10th, 2014 at 8:12 a.m.